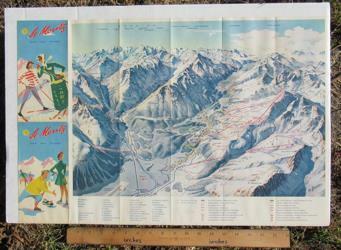 Color illustrated brochure map of the St Moritz ski area in Switzerland. The brochure is not dated but photos on the backside suggest that it is from the late 1950s or early 1960s. 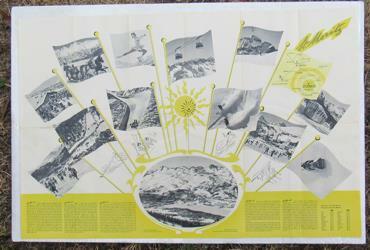 The front of the sheet shows a map of the ski area. The other side has several b/w photos of activities and views of the St Moritz vicinity. CONDITION: The brochure has crease marks at the folds, no tears, very minor general wear, no writing or marks. It is original and not a modern reprint. Price: $45.